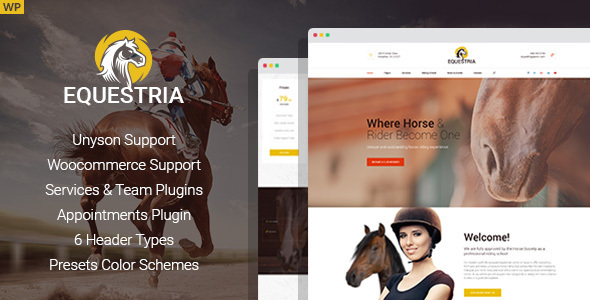 Equestria – WordPress theme for an equestrian club, horse riding courses and training programmes, race tracks and courses and horseback riding sports website. If you are a horse track owner or an executive of a horseback riding school then you definitely need a professional website. It will not just be a sign of your company’s prestige and your being up to date with the modern technologies. With a help of a website, you will make a statement to so many people that will eventually become your potential customers. You can customize the looks of your pages with a drag-drop page builder. This equestrian theme comes with several options for headers and three predefined color schemes. You can also choose between the light and dark version of the theme. It features fonts from Google Fonts Library and FontAwesome icons. It works with all the devices and it’s super responsive. The code of the theme is very well formatted and commented.